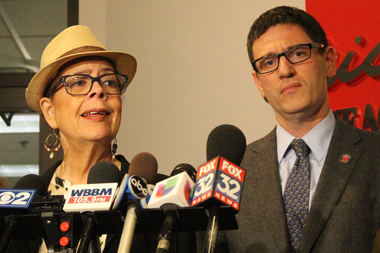 CTU President Karen Lewis and Vice President Jesse Sharkey say negotiators are making progress on a compromise with district officials. CHICAGO — The Chicago Teachers Union bargaining team will take the weekend to consider a new contract offer from Chicago Public Schools, CTU president Karen Lewis said in a statement Thursday. The 40-member body will vote Monday on whether to forego the union's second strike since 2012 and accept what Lewis called a "serious offer" from CPS negotiators. The details of the contract offer are being kept under wraps, but Lewis said its "basic framework calls for economic concessions in exchange for enforceable protections of education quality and job security." CPS CEO Forrest Claypool, for his part, called the offer a "true compromise that requires sacrifices from both sides," according to a Thursday night statement. "We will continue to work around the clock to reach consensus on an agreement that is the best interests of our students, educators and parents,” Claypool added. About a month after CTU voted overwhelmingly in favor of a strike, Lewis struck a more optimistic tone last Friday, saying her side's negotiators were "doing well" in an effort to meet district officials halfway. If the contract is accepted, Claypool said, it would mean saving untold numbers of teachers from the looming prospect of midyear layoffs amid the district's gaping $480 million budget shortfall. The offer came less than a week after CPS officials announced they were cutting 433 positions in administrative offices around the district, a "painful" measure they framed as an effort to lay as much of the budget burden as possible outside of classrooms. This year's CPS budget was drawn up with a nearly half-billion-dollar hole with the expectation that state lawmakers would step in and provide the needed funding, but as the state heads toward its eighth month without a budget, administrators are scraping for ways to prevent massive teacher layoffs.